Recovery. Healing. Hope. The journey starts here. The first step begins with a call to one of our Alcohol & Drug Adult Services Programs. You may be concerned about signs of drug use with someone you know. You may be concerned about yourself. When in doubt, speak to a professional. Just take the first step. Ventura County Alcohol & Drug Programs offer a range of outpatient treatment services designed to help individuals coping with a substance use disorder. Our services include screening, crisis intervention, individual, group and family counseling, HIV education, assessment and evaluation, referrals to community based services, and outreach to the community. Our programs are county-wide, with clinics located in Oxnard, Ventura, Simi Valley, Thousand Oaks and Fillmore, CA. Specialized programs provide services for pregnant and parenting women, adolescents, and persons who have been dually diagnosed with substance use and mental health problems. Fees are based on an ability to pay. 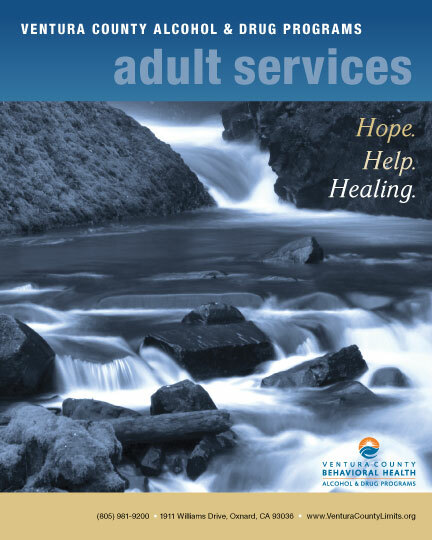 Our Adult Services are designed for adults 18 and over seeking help with alcohol and/or other substance use problems. Our Centers promote recovery from substance use problems and provide leadership in the treatment of alcohol, substance use and co-occurring substance use and mental health disorders. We strive to reduce the destructive effects of the use and abuse of alcohol and other drugs on individuals, families, and the community. We are dedicated to client’s empowerment in their personal journey of recovery from addiction. An individual with a substance use problem, along with their family members, will receive treatment in a caring and client-centered environment. Counselors are available to provide treatment, education and support, leading to the development of a healthy lifestyle and the hope for a brighter tomorrow. Why Ventura County Alcohol & Drug Programs? Evening groups and appointments are available as needed.